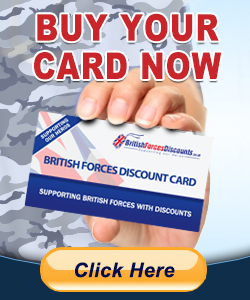 YOUR FORCES DISCOUNT CARD - Just £5.95! ....including 423 new Forces Discounts this month. For thousands of instore offers available on this website, you will need a British Forces Discount Card available only from BritishForcesDiscounts.co.uk. Cards are just £5.95 (incliding p&p) - a one off payment. This will provide you with a lifetime of discounts at bars, cafes, shops, restaurants and more thoughout the UK.